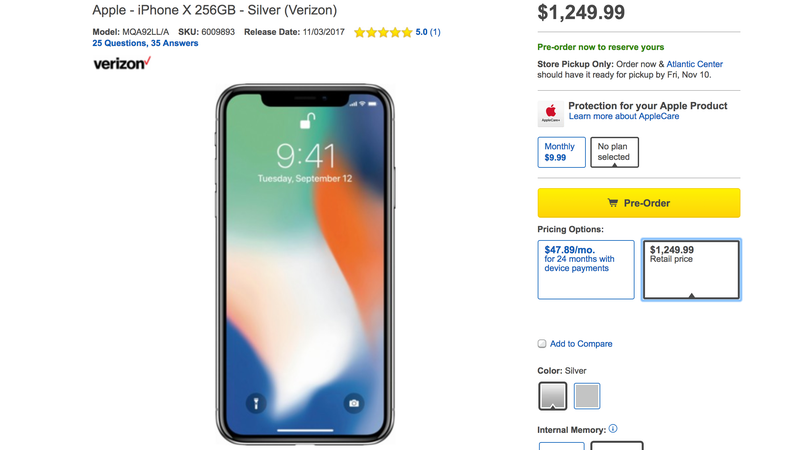 Why Is Best Buy Overcharging for the iPhone X? Best Buy is charging more for iPhone X buyers who don’t want installment debt. If you want to pre-order the iPhone X through Best Buy and pay for the whole device upfront then you have to pay $100 more than if you choose the Best Buy installment plan or if you buy the phone through the Apple Store. Weird. Apple started taking pre-orders for the iPhone X early Friday, 3 AM EST/12AM PST—a week ahead of the official November 3 launch—but within minutes, eager buyers began receiving notices that their phones wouldn’t be shipping for another two to three weeks. At time of publication, the shipping date is about 5 to 6 weeks out. Best Buy is also offering a pre-order of the iPhone X with a pickup and delivery date of November 15. Of course, there’s no telling whether Best Buy will actually be able to ship by November 15. Sprint and T-Mobile currently claim the shipping dates are between November 2nd and 11. Best Buy and the carriers are probably all at the mercy of Apple’s supply. The Best Buy pre-order page even states the full price as being what is available on the Apple store. Best Buy did not respond to a request for a comment about why it is charging $100 more for the iPhone X. It appears no other major retailers that sell iPhones, like Target and Walmart, are currently offering an iPhone X pre-order. I would not be able to say why our price for the unactivated iPhone 8/8 Plus are $100 more than Apple is charging, but I can say we work to remain competitive, and we do have our price match guarantee where we would match lower prices found at a competitor in most cases. With that said contract phones like the iPhone 8/8 Plus do not qualify for our price match guarantee. No, that is not correct, Allan. Sometimes customers aren’t able to purchase phones at other locations because their desired plan or carrier makes them ineligible. That’s not the case at Best Buy, as our prices reflect the fact that no matter their desired plan or carrier, or whether a customer is on a business or personal plan, they are able to get a phone the way they want at Best Buy. Flexibility has a cost, but it’s something our customers have told us they want. So Just How Did iPhone X Pre-Orders Go?